Is digital knowledge sharing truly universal? Join The West African Elibrary Collaborative (WAELC) Working Group at Duke University as they welcome Williams Nwagwu. He will discuss African universities over-realiance on a model of knowledge transfer that privileges one-directional closed access publications from the Global North. This event has been made possible by: Duke Africa Initiative, Digital Humanities at the Franklin Humanities Institute, Information and Science+Studies, Franklin Humanities Institute (FHI), Duke International Comparative Studies, The Knowledge Exchange Research Group. 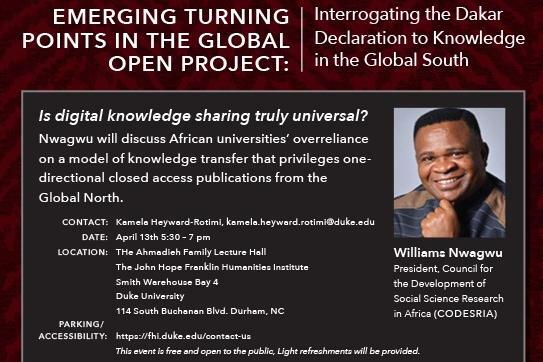 At another event the WAELC Working Group at Duke will lead a conversation about access to digitized knowledge at African universities, and plot future steps for addressing the inequitable exchange of knowledge between the Global South, and the Global North. Guest contributors are: open access expert and president of CODESRIA, Williams Nwagwu; Olusoji Ilori, Engineering Lecturer from Obafemi Awolowo University in Nigeria and MIT ILab Fellow; and a representative from the James E. Shepard Memorial Library of North Carolina Central University. For more information about this event please visit: www.thekerg.org.